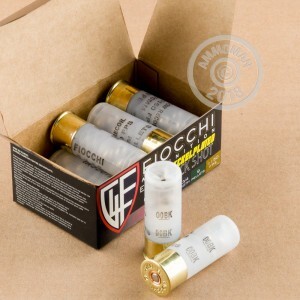 Low recoil shotshells firing 00 buckshot are the preferred self-defense load for many shotgun owners and law enforcement agencies. 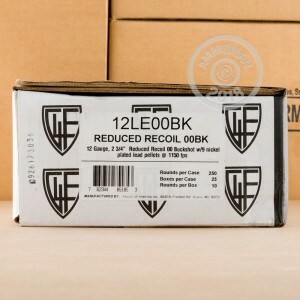 The reduced powder charge of this ammunition reduces the risk of over-penetration as well as the amount of recoil generated by each shot, making a higher rate of aimed fire possible. Each 2-3/4" shell in this box of 10 fires nine pellets of 00 buckshot at a muzzle velocity of 1,150 feet per second. This is about 200 fps slower than a typical hunting load and comes with the above mentioned benefits against human assailants. 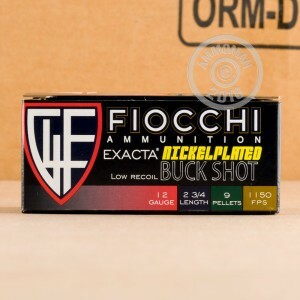 Fiocchi shotshells sold in the US are primarily loaded in Ozark, Missouri, with some also being imported from the company's headquarters in Italy.